There are certain types of food out there today that bring out the types of salivating responses restaurant owners would love to hear from their patrons. There is elegant French cuisine. This is considered elegant because of the way dishes are cooked. This has been added to UNESCO's list of the world's intangible cultural heritages. There is American cuisine, which is a mix of different styles of cooking from all over the world. Other types of food known all over are Italian cuisine and products. Italian ingredients and cooking have now made its mark in virtually every part of the world. Italian cuisine is famous all over the planet. This is a fact. Go to any major city in the world and most probably you will find a restaurant serving Italian food. Kitchens in households all over the world are known to serve food every now and then. Based on an article in Il Giornale, Italian food exports have risen greatly in spite of global economic crises. A passage reads, "The British drink our beer, grappa is overtaking vodka in Russia, spumante is closing in on champagne." Exports of food products have risen too. For instance, wine exports to China have doubled at 108 percent, while in India it is at 65 percent. The world just can't seem to get enough of food exports. They want Italian food served at their tables. With that in mind, the quality of Italian food products is another important factor as to why there has been a constant surge in their export. Food products from Italy are just that good. Ask Coldiretti, which is the most important Italian agricultural organization. It represents 54 percent of all Italian farmers. As per Sergio Marini, current President of Coldiretti, Italian food exports in the first quarter of the year 2011 rose to 11 percent, more than any other Italian export. There are many reasons why Italian ingredients and cuisine are loved throughout the world apart from their quality. Italian cuisine is characterized for its simplicity, with the food relying more on "the quality of ingredients rather than on elaborate preparation," as per celebrity chef Mario Batali's book, "Simple Italian Food: Recipes from My Two Villages." In contrast to French cuisine, which relies heavily on refined and oftentimes complicated cooking methods, Italian cuisine is simple, with many of the best recipes being created and handed down by grandmothers instead of professional chefs. This is another reason why Italian cuisine has fitted in so snugly in the kitchens of homes around the world - because much of Italian cuisine was created in ordinary kitchens. Now, eating Italian cuisine is simple. All you need to do is get some good ingredients from a grocery. Then, prepare the food by using an Italian recipe; simple, yet delicious. The future of Italian cuisine looks bright. Exports of Italian food products continue. Homes around the world clamor for more of Italian cuisine in their kitchens. Italian suppliers are more than happy to oblige. Many restaurants in the United States and Europe feature Beef Stroganoff on their menu cards because this simple seeming dish is incredibly popular with diners. As a matter of fact, it is also a standard feature in five star multi-cuisine restaurants and coffee shops all over the world. Like many popular dishes eaten today, this one has a very interesting story. How much of this story is authentic is open to interpretation because there are many more conflicting accounts of how the dish originated. What most people agree upon, however, is that this meal is Russian in origin and versions of it date back no earlier than the 18th century. The most common story concerning the origin of the Beef Stroganoff is that it has been named after a 19th century Russian nobleman called Count Paul Stroganoff. A friend of Tsar Alexander III, he used to entertain quite often and his invitations were always in great demand because of the delicious food served at his home. It is believed that he had a very good chef who used to serve a delicious dish made of sautéed strips of tender meat cooked in a subtle cream sauce containing mushrooms and onions. The dish was supposedly so popular that it made its way into many people's kitchens and from there into popular usage. Since variations of this recipe were in use in Russia much earlier than the 19th century it is very likely that this recipe was in the Count's family for a very long time and that it came into public notice only because of the count's love of calling people home for dinner. The Beef Stroganoff eventually began to be featured in popular cookbooks and quickly became the popular dish it is today. The earliest mention that one sees of a Beef Stroganoff recipe is in l'Art Culinaire dating back to 1891. According to popular opinion, this recipe was first seen in English in 1932 in a book called Good Food written by Ambrose Heath. Once it was featured in English cookbooks this recipe spread all over the world including to the United States. There are a few interesting versions of this dish available in internet recipe compilations because of its immense popularity. It is also extremely easy to cook and is well loved by children and adults alive, which makes it a regular feature on dinner menus across the United States. Read about the origins of the beef stroganoff recipe that you might have used on many occasions. Enjoy a delicious beef stroganoff knowing that this was a dish enjoyed by the Russian nobility. 3 Great Ideas For Chicken on National Chicken Month September is National Chicken Month. A month for chicken lovers to enjoy. Who doesn't love it anyway? Everybody loves chicken so this becomes an all-time favorite. There are hundreds of ways to cook it and you have many options as to which of them can satisfy your palate. But, before you start to cook that mouth-watering recipes that you can think of, it is important that you choose the best quality chicken . Why not buy organic if you can afford it? I assure you it is worth the extra cost. It is not only because of the best level of well being, but you also acquire a better quality and a meat flavor that is fuller. Raising organic chicken costs more as it requires more space per fowl and an access to outside pasture not to mention the use of a better quality pesticide. Next in line for the better choice is the free-range. It roams around for food on open pastures thus requiring an outdoor space that is sheltered and spacious for every fowl. Costly but worth the price. Here are 3 simple and great ideas for your chicken that every one can enjoy. Slow - Roast Chicken with Maple Syrup Ingredients: 1 whole chicken 1 garlic separated into cloves and crushed 1 tbsp olive oil 1 tablespoonful wholegrain mustard Method: Pre-heat oven to 400°F. In a mixing bowl, mix garlic, olive oil, maple syrup and mustard. Brush the chicken liberally with the mixture. Place the chicken on a rack in a roasting pan. Cook for 15 minutes. Lower down the temperature to 250°F and cook for another hour. Then turn back to 400°F and continue roasting for another 20 minutes or until the internal temperature is160°F. Remove from the pan and cover loosely with foil on a plate and let rest for at least 10 minutes before carving This can be served with the juices left on the pan. Slow-roasting is the best way to keep the chicken moist. Minced Chicken Salad With Salad Vegetables and Lemon On The Side Ingredients: 4 pcs chicken breasts, skinless 2 lemon grass, roughly chopped 4 pcs lime leaves, roughly chopped 4 cloves garlic 1 finger-length ginger, fresh 1 tsp vegetable oil sesame oil 1 red onion, chopped a handful of chopped coriander leaves, basil and mint 3 tbsp fish sauce To serve on the side: 3 leaves lettuce, separated 200 grams bean sprouts 1 unseeded cucumber cut into strips 1 pc. lime cut into wedges Method: Minced chicken breasts into tiny pieces manually to create a juicier and softer texture. Meanwhile, place the roughly chopped lemon grass, lime leaves, garlic and ginger into a food processor until finely chopped all together. Heat a wok over a high heat. Add vegetable oil and sesame oil. Add the lemon grass mixture and fry briefly. Add minced chicken breasts. Stir-fry for 5 minutes and add the fish sauce. Decrease the heat a little and let chicken and fish sauce to bubble together for another 4 minutes. Stir and add chopped onions and continue cooking for another minute. Take away from the heat and splash the lime and toss in the handful of herbs. Transfer in a salad plate and serve with the lettuce, cucumber, beansprouts and lime on the side. Option: You can add chilli powder if you prefer your salad hot and spicy. Soft Chicken Tacos Ingredients: 4 chicken thighs fillet, skinless 1 tbsp olive oil 2 tsp ground cumin 2 pcs. lemon, juiced 1 small size avocado, diced ½ cup black beans, rinsed and drained ½ small size red onion, finely chopped 10 pcs cherry tomatoes, quartered a small bunch of Chinese parsley or cilantro, chopped salt and pepper to taste 4 to 6 pcs. flour tortillas Method: Marinade chicken unto the spices, olive, oil, half of the lemon juice, salt and pepper for 20 minutes. Meanwhile mix the avocado, beans, tomatoes, onions and the other half of the lemon juice and add a pinch of cumin to make a salsa. Under a hot grill, cook the chicken for at least 12 minutes, turn the other side until crisp and cooked through. Slice after resting for a couple of minutes. Warm flour tortillas. Serve with the salsa and tortillas and drizzle with the coriander. Try these chicken recipes and I'm sure they can become family's favorite not only during chicken month but cook them again and again. Enjoy your National Chicken Month! Browse a wide selection of quality cookware, bakeware, cutlery and other related kitchen equipments at our on line location YourSmart Kitchen. A majority of people often go out for dinner at least once a week. This event can either be due to some special occasion between a couple and a good way of making your family experience some good and enjoyable times away from the home. Taking your family or your spouse out for a dinner date is also another way of breaking out from the norms. It has always been said that a change is as good as a rest. Before going out for dinner in one of those fancy restaurants, in most cases you are expected to make an early booking in order to get a reservation for two or depending on the number of people going for dinner. In most cases going out for dinner maybe something done only on a few occasions due to the amount of money one has to part with to pay for the dinner. Things have now changed and you can actually enjoy your dinner dates in those fancy restaurants you have always admired from a distance. Things have now changed due to the fact that you can now visit some of the most popular restaurant daily deals websites such as Scoopon and find out all the information first hand of all the available fantastic dinner deals being offered in some of the best restaurants around. Through the wide variety of information presented to you, you will finally be able to make your decision in terms to which restaurant you will book for your dinner date. The importance of such websites are not only seen in the numerous dinner deals available for you but also due to the fact that all this information is always up dated thereby allowing you the chance to enjoy all these bargains on a daily basis. Another benefit brought about by the use of such websites is due to the fact that they provide you information regarding all the major restaurants across Australia and its different cities. You will therefore be able to log into these sites even when travelling outside your town and study all the available dinner deals being offered by the restaurants closest to you. This will save you both money and time as you will not be required to go around asking about the best places to go eat and enjoy some excellent dinner deals. What a way to stay on top of things regardless of where you are. Find more dinner deals in our site. specialties with a French twist. Savings-minded travelers may not always be able to spring for the loftiest hillside hotels, but a single meal at a spectacularly situated restaurant can be a worthy splurge. From glacial peaks to ancient rain forests—even an underwater dining room in the Indian Ocean—we've rounded up 12 unforgettable places to pick up a fork. The untamed Andes from the southern-most city in the world. You might not expect to find world-class French food in a frontier city that's more or less at the ends of the earth—which makes Chez Manu an even more pleasant surprise. Set on a hill about a mile north of Ushuaia, the capital of Tierra del Fuego and the southern-most city in the world, the restaurant first impresses visitors with its remarkable perspective on Beagle Channel. And then there's the food. Naturally, fish figures prominently—such as black hake, salmon, and herring, to which expat chef Emmanuel Herbin applies his own suitably French twists (seasoning with anise and herbs, say). Also worth a try: Herbin's takes on Patagonian lamb and Fuegian rabbit, served in an aged mustard sauce. Best Deal: Centolla (king crab) is abundant here, and preparations such as centolla gratinada "Chez Manu" come in well below splurge territory ($24). 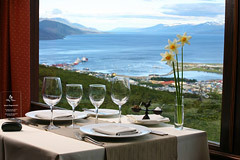 2135 Fernando Luís Martial Ave., Ushuaia, Argentina, 011-54/2901-432-253, chezmanu.com, entrées from $15. Julaymba Restaurant sits within the world's oldest rain forest. Primordial paradise in the midst of the jungle. 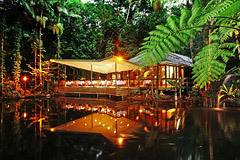 Julaymba Restaurant brings travelers right to the heart of the world's oldest rain forest. The 40-seat restaurant's terrace juts out over an ancient freshwater lagoon while tangled vines drape from the canopy above. From every direction, diners hear the sounds of some 430 species of birds, plus tree frogs, wild turkeys, and wallabies thumping through the brush. The distinctly Aussie menu incorporates pepper berries, wattle seeds, and other native foods used by the local aboriginal Kuku Yalanji people, many of whom work in the restaurant. Make like a local, and order either the smoked crocodile or the kangaroo steak. Best Deal: The lunch-only fish-and-chips special—it's made with local, line-caught barramundi and chips ($17). Daintree EcoLodge & Spa, 20 Daintree Rd., Daintree, Australia, 011-61/7-4098-6100, daintree-ecolodge.com.au, entrées from $29. Pierchic provides a study in contrasts when viewed with Burj Al Arab's 1,000-foot-tall glass sail in the background. Over-the-top architecture in the world's most outrageous city. For all the glamour, glitz, and grandeur that have come to define Dubai, Pierchic stands out for being just the opposite: understated, low-slung, and vernacular in its architectural style. 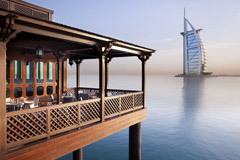 Its wooden beams blend right in with the simple, 500-foot jetty that connects the over-water dining room to Jumeirah Beach and provides enough distance to take in the man-made Palm Jumeirah Island and the full height of Burj Al Arab's 1,000-foot-tall glass sail. Despite the restaurant's waterfront location, much of its top-notch seafood is imported from around the world. Best Deal: The seafood lover's degustation menu, which includes an appetizer, an intermediate and a main course, and a dessert ($43). The menu changes daily, but expect options such as brown shrimp panna cotta, pan-fried oyster, and crème brûlée. Served daily from 1–3 p.m. Al Qasr Hotel, Madinat Jumeirah, Dubai, 011-971/4-366-6730, jumeirah.com, entrées from $27. There are only 12 seats at the Ithaa undersea restaurant off Rangali Island in the Maldives—all of them have fantastic views of the Indian Ocean overhead. Scuba views from beneath the ocean. It's like dinner theater for the dive set—and there's not a bad seat in the house. Ithaa is located 16 feet below the surface of the Indian Ocean. Its tunnel shape and glass walls reveal a breathtaking seascape of unspoiled coral atolls, schools of parrot fish, and giant stingrays to 12 lucky diners. The menu is rich with decadent dishes like caviar, line-caught reef fish and rock lobster, but if you'd rather not look out the window for your ordering inspiration, seared veal tenderloin and button-mushroom soup make for suitable substitutions. And while the four-course lunch menu is undoubtedly a splurge, it's still cheaper than getting certified to scuba. Note that tables can only be reserved two weeks in advance. Best Deal: An 11 a.m. daily cocktail hour opens up the space to curious travelers who can't quite justify the cost of a meal. 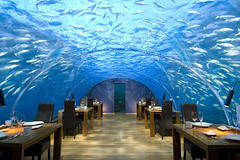 Conrad Maldives hotel, Rangali Island, Maldives, 011-960/668-0629, conradhotels1.hilton.com, six-course dinner from $320 per person. From Le Déli-Cieux, patrons can see the most iconic features of the Paris skyline—the Arc de Triomphe, the Sacré Coeur, and the Eiffel Tower. A Parisian panorama from one of the city's most iconic department stores. In a city where shopping has been elevated to an art form, it's fitting that one of the best roof-terrace restaurants sits atop the iconic Printemps department store, in the 9th arrondissement. 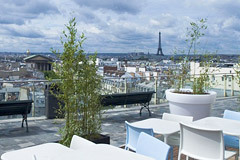 Serving simple bistro fare (think quiche, soups, and toasted spinach-honey-and-goat-cheese sandwiches) to Parisians and tourists alike, Le Déli-Cieux also delivers 360-degree views of the city's centuries-old tin rooftops and its greatest architectural icons: the Arc de Triomphe, the Sacré Coeur, and bien sur, the Eiffel Tower. Best Deal: Well-priced wine, champagne, and beer ($7) flow freely on Thursday evenings, when the terrace is open until 10 p.m. Printemps Home Store, 64 Haussmann Blvd., 9th floor, 9th arrondissement, Paris, France, 011-33/42-82-62-76, departmentstoreparis.printemps.com, gazpacho from $6. 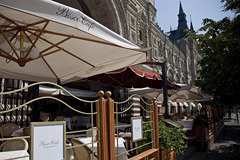 Bosco Bar in Moscow overlooks the Kremlin, St. Basil's Cathedral, and Lenin's mausoleum all at once. A view of the country's most famous gilded square. Bosco Bar hits a rare sweet spot: There is a bona fide social scene, plus impressive sightlines and prices you can actually stomach. While the shopping center itself draws wealthy Muscovites browsing Hermès and Armani, savvy travelers stake out seats in the 1970s-inspired bar, where they can see Lenin's mausoleum, the Kremlin, and St. Basil's Cathedral all at once. The menu straddles the new/old divide, with inventive salads (quail with beets and roasted foie gras; smoked salmon, arugula, and potato) and traditional favorites such as beef Stroganoff and borscht. Best Deal: Red Square, red soup: A bowl of borscht goes for $16. GUM Department Store, 3 Red Square, Moscow, Russia, 011-7/495-627-3703, bosco.ru/en, entrées from $11. 1-Altitude occupies the top three floors of the 63-story OUB Centre, on Singapore's version of Wall Street. A lofty view of a sparkling metropolis. The 63-story OUB Centre is crowned by 1-Altitude, a three-level venue that offers the best views in the city—plus main-course-quality bar snacks such as wood-fired pizzas, satay platters (spicy Thai beef, chicken, and pork), and Turkish flat bread with dips. The cocktails run the gamut from classic (mojito) to creative (The Narcissist is a tempting combination of Russian Standard vodka muddled with peach, freshly squeezed lime, and rosemary-infused raspberries). The year-old hotspot is always buzzing with young Singaporean professionals, who are keen to kick back after a day's work and survey the skyline. Best Deal: Good selection of affordable New World wines, from $13 a glass (cocktails start at $16). 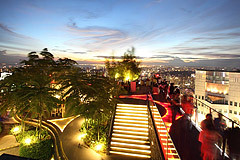 OUB Centre, One Raffles Pl., 63rd level, Singapore, 011-65/6438-0410, 1-altitude.com, pizzas from $20. The on-site Boucan Restaurant takes in the island's lush tropical foliage and surrounding mountains. From the heart of a chocolate plantation. Calling all chocolate lovers: Boucan Restaurant might just be your dream come true. Every last item on the menu incorporates some form of cocoa, from a green salad tossed in white chocolate dressing to sautéed prawns with chocolate tapenade and, of course, desserts: a chocolate tart, cacao crème brûlée, and espresso-and-dark-chocolate mousse. Even dreamier than the indulgent dishes? The jungle-draped views of the Piton Mountains, lush, twin-peaked mountains that rise almost 2,600 feet above sea level on the volcanic island's southern coast. Best Deal: Every dinner reservation from now until December 1, 2011, comes with a complimentary cocktail from a menu that includes chocolate daiquiris, cacao Bellinis, and cacao-pulp martinis (a $10 value). Hotel Chocolat, Rabot Estate, Soufrière, St. Lucia, West Indies, 011-758/457-1624, thehotelchocolat.com, entrées from $15. Whatever the season, Kuklos claims incredible vistas. Alpine splendor overlooking Lake Geneva, Mont Blanc, and the Matterhorn. Talk about making the rounds. 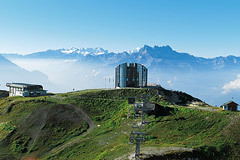 Patrons of Kuklos, a futuristic, glass-walled restaurant in the Bernese Alps, don't have to choose between scoping out Lake Geneva, Mont Blanc, or the Matterhorn during their meals. All they have to do is be patient. Every 90 minutes, the circular second-floor dining room makes a full 360-degree rotation. The menu skews traditional—with Gruyère-and-vacherin fondue and rösti, a Swiss riff on a potato pancake—and the dress code is casual, for a clientele of mostly skiers and mountaineers. Best Deal: The "panorama gourmand" package covers round-trip gondola fare (normally $26 per person) and a three-course meal ($80) for two for $160—a savings of $52. 1854 Leysin, Switzerland, 011-41/24-494-3141, teleleysin.ch/en, entrées from $25. 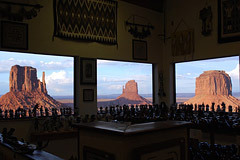 The dining room of the restaurant at the View Hotel in Monument Valley, Utah, looks out over East and West Mitten Buttes. Iconic buttes and majestic spires. "Monument Valley is the place where God put the West," remarked John Wayne, who helped put the valley on moviegoers' maps by filming Stagecoach there in 1938. Seventy-plus years later, the landscape is just as cinematic. A large bay window overlooks East and West Mitten Buttes, so named for their resemblance to the woolly hand warmers, and natural light floods the space all day. Ambitious early birds can watch the sunrise from one of the few tables lined up along the window (the restaurant opens at 7 a.m.). But arriving later has its benefits, too—like tasting Chef MacNeal Crank's updated takes on his grandmother's traditional Navajo recipes, such as fry-bread tacos or red chile posole, rich with buttery hominy. Best Deal: The all-you-can-eat breakfast buffet ($6). Monument Valley Tribal Park, U.S. Hwy. 160 and 163, Monument Valley, Utah, 435/727-5555, monumentvalleyview.com, entrées from $12.